Finding the right presents for friends and family can be tricky, especially for the people who already have everything. But there’s one thing no one has, yet… A limited edition Southern Comfort Louisiana Jam Gift Set. 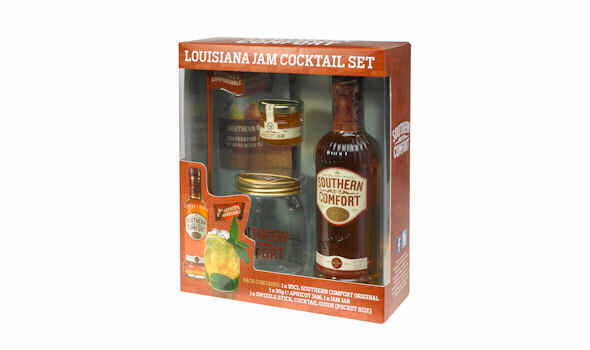 The helpful people at Southern Comfort are making your life easier this Christmas by launching a quirky gift set that contains all the ingredients you need to make cocktail favourite Louisiana Jam; including a 35cl bottle of Southern Comfort Original, a jar of apricot jam, a jam jar glass and stirrer. It’s the perfect gift for friends, family, neighbours, and if you’re feeling generous - your boss. But sometimes, the best presents don’t come in fancy gift sets. If you know someone that loves the great taste of Southern Comfort they’ll be delighted to find a 70cl bottle of Southern Comfort Original under the tree this Christmas. No frills, just an awesome drink. Southern Comfort is a unique mix of whiskey, fruits and spices and tastes awesome in cocktails, but also great on its own. Serve in a tall glass, filled with ice, lemonade and a squeeze of fresh lime. Perfect. Southern Comfort Louisiana Jam Gift Set costs £25.00 and includes a 35cl bottle of Southern Comfort Original with 35% ABV. Available from selected Tesco stores from 15 December. Southern Comfort Original is available in a 35cl, 70cl or 1 litre with 35% ABV bottle and is available from all good supermarkets and independent retailers 365 days a year. Keep an eye out for special promotional prices from now until January – meaning you can pick up this refreshingly delicious drink, for less!